UMP | University of Minnesota Press Blog: Disagreement abounds about the best way to serve deaf children. Disagreement abounds about the best way to serve deaf children. A common argument for using sign language with hearing babies is that it would have benefits that are practical (less fussing), emotional (creates a closer parent bond), and cognitive (boosts brain development). “Fewer tantrums and more fun!” claims the website Baby Sign Language. Using sign with babies has become popular in recent years, and many claim it facilitates communication—which is key for healthy development. There is a dearth of research to support these claims. In perhaps the greatest irony for deaf children, signing is often discouraged in the United States—which also happens to be the world’s largest medical device market. As I outline in my book, Made to Hear, the cochlear implant (CI) has become more frequently used in deaf children, and clinics often give parents the opposite advice that they give parents of hearing children: signing is risky and will impede your child’s speech development. But there is a dearth of research to support these claims, too, and even research to suggest that the opposite is true and that sign may actually aid in the spoken language development of children with CIs. 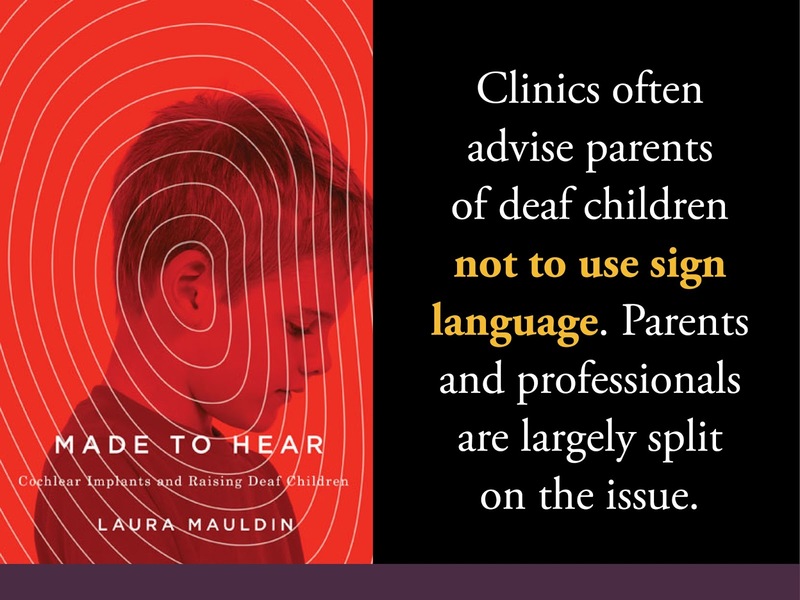 While my book outlines these patterns of advice to mothers, particularly when it comes to newborns and infants, I have since turned my focus to examining what becomes of deaf children who are denied sign language early in life. What about children who may in fact have benefited from access to sign? How do these clinical practices translate into educational practices and what problems arise because of it? On March 2, 2016, a coalition of supporters for a recent bill introduced in the House of Representatives, H.R. 3535, also known as the Macy-Cogswell Act, converged on Washington, DC. According to attendee Jeff Bravin, more than 100 people showed up to advocate for new laws that they believe would better support deaf, as well as blind, students. While some students are indeed deaf-blind (that is, have both visual or hearing impairments), the partnership between educators who teach deaf children and educators who teach blind children came out of necessity. On their own, a coalition of deaf education-related organizations was unable to garner the support needed for the bill. But in joining forces with stakeholders in education for blind or visually impaired children, the Macy-Cogswell Act was eventually introduced. The meetings that took place on March 2 resulted in a new co-sponsor of the bill, Representative Larson, D-Connecticut. The Macy-Cogswell Act is described by the Conference of Educational Administrators of Schools and Programs for the Deaf (CEASD) as necessary for ensuring that deaf students get the specialized teaching they need in a timely manner. This organization is made up of those who educate children in deaf schools; that is, they work with deaf children in a sign language-friendly environment and tend to promote bilingualism in both English and American Sign Language (ASL). The push for “appropriate” assessment of children’s language or instructional needs partly comes from patterns like this: The average age of enrollment in the American School for the Deaf is between 12 and 14 years of age. A portion of these students (including some with CIs) had been denied meaningful access to sign in their prior placement in an effort to focus on spoken language. Deaf schools are then enrolling children who are far behind, but could have been given access to ASL earlier. We know that language deprivation has devastating effects on development, but without comprehensive, aggregate empirical data on how those children ended up being placed at ASD, where they were before, and what spoken language skills they brought with them, it is hard to make evidence-based claims about which practices are best. Nevertheless, the arguments and analyses of those who are on the ground in deaf schools on a daily basis are clearly that more sign language access is needed and it is needed sooner. This group does not articulate an argument to exclude speech, only an argument to include sign. Would it be possible to add ASL as a viable tool in the clinical context or earliest educational placement, especially since there is no evidence to support the claims that sign impedes speech? The Alexander Graham Bell Association (AGB) characterizes the legislative efforts regarding Macy-Cogswell as “well intentioned,” but critiques these laws that “frequently have language that focuses on access and rights to sign language which is not relevant to the majority of students who are deaf and hard of hearing in the public schools.” They go on to cite that 52% of deaf children are pursuing a spoken language approach. AGB is the largest organization in the US that promotes a “Listening and Spoken Language” approach and even has certificate programs that train teachers in such approaches. It suggests a number of aspects that should be included in the laws instead, including setting their certificate in listening and spoken language as the standard for providers who work with deaf children. In their view, ASL is irrelevant. These two groups could not be more different. This pattern of viewpoints is nothing new when it comes to the question of what we should do about deaf children. Do they need to overcome their deafness through medical and educational intervention that could give them a better ability to hear and speak? Or should their deafness be accepted, dealt with through using a visual language like American Sign Language (ASL), and all other developmental and educational milestones achieved through this method? There never seems to be agreement over which is the ‘right’ answer and there is no formula for knowing which is the best route for all deaf children. But what if we stopped assuming it was an either/or question? What if the CI and ASL were standard and utilized in tandem? 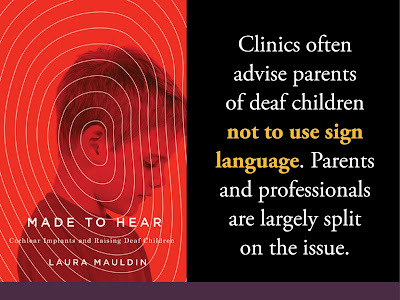 It seems the biggest barrier to combining efforts to serve deaf children is professionals’ refusal to hear each other. Laura Mauldin is assistant professor of human development/family studies and women's, gender, and sexuality studies at the University of Connecticut. 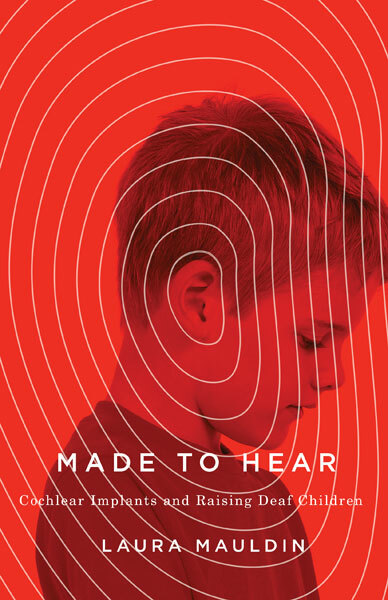 She is author of Made to Hear: Cochlear Implants and Raising Deaf Children. Kudos to Jeff Bravin for highlighting this important facet of language development for deaf children. I have a hard time accepting the 52% oral claim made in the article, but at whatever level, the success of oral students is due in great part to the depth of assistive services and support that is available to deaf children in the US in terms of speech therapy, inclusive classrooms, hands on interpreters, etc. But this model is not realistic for a large part of the deaf population globally, especially in developing countries. Our 7 Deaf Reach Schools in Pakistan provide free education to more than 1,000 deaf children - and this is done in a total signing environment. Not only is this empowering for the children, but also for the teaching staff, 55% of whom are Deaf. Because they have language to understand and communicate, they make solid progress through their academic subjects, leading to graduation, higher studies, and ultimate employment. These students, and the majority of all deaf children in Pakistan (more than 1 million, yet less than 2% have access to school), come from families with low income, low education backgrounds. They do not have the resources to manage cochlear implantation, and even in those cases where implants have occurred through a variety of sponsored medical programs, proper follow up with the needed speech therapy and tech support is sorely lacking. There are only a handful of qualified speech therapists in the country, most all of whom have their private practice and are not available to assist at the school level. Under these conditions, if the goal is to truly educate and empower deaf children to learn, to grow, to succeed and to take ownership of their lives, the oral vs sign debate is rhetorical at best. Without the Voice these children gain through a sign language rich school environment, that goal would be very difficult to achieve. Yes, there are some successful oral deaf children and young adults here in Pakistan, just as are found in any other part of the world. But these are much more the exception than the rule, and when we are speaking of an educational approach that is going to be effective for the large number of deaf children in Pakistan and other similar countries in the developing world, there is no debate that a signing approach is the most effective.